Beezleboss' latest custom kit features a new head for Transformers Generations Red Alert, pile drivers for Universe Sideswipe and new weapons for both Autobots packaged in a box with all-new original artwork. I have to say I've been working on this review for nearly two weeks and it's been killer! The set is good, not great, but good. However, I've just hit a few blocks trying to get my thoughts on it out here. Beezleboss has done fantastic work on previous kits for Cliffjumper/Bumblebee and Goldbug so I was very interested in this new set that replaces the horrible engine/blasters included with 'swipe & Red Alert who happen to share the same mold and transformation. But I think the set didn't quite turn out the way they were hoping it would and that's more obvious on some of the pieces than others. 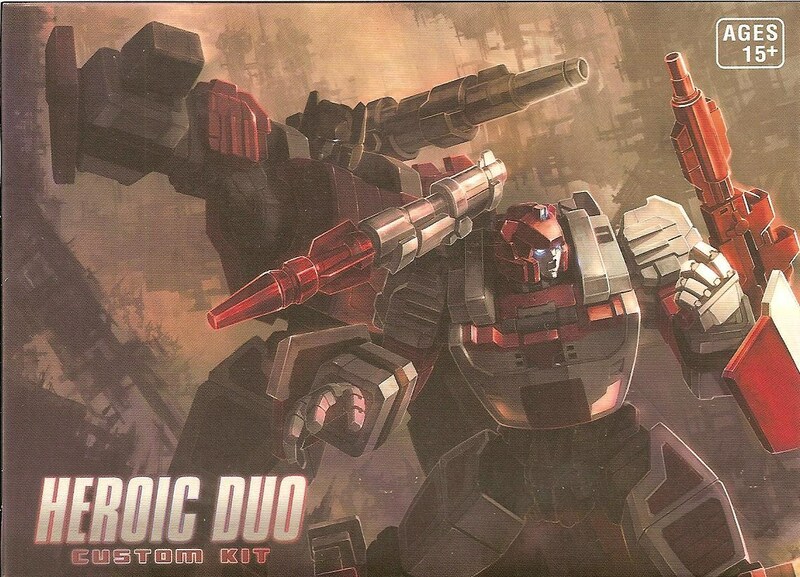 First up, the kit includes a total of 11 pieces: 4 shoulder brackets, 2 blaster rifles, 1 missile launcher & 1 head for Red Alert, 1 shoulder cannon & 2 piledrivers for Sideswipe. The shoulder-mounted weapons for each figure are based on what they had in the old G1 cartoon. In order to mount the weapons on the figures' shoulders, Beezleboss created plug-in pieces that utilize existing holes on the frame of each robot. The pieces also create a sort of collar seen on the old character models for the two Autobots. Each piece is molded in a light colored plastic and then painted silver and therein lies the biggest issue with this set: the paint. I don't know if it's due to the quality of the paint used or the way in which it was applied, but it has a "cheap" look to it. Each of the brackets have a slot for the mini c-clips on the shoulder weapons. Red Alert's missile launcher is molded in white plastic and is comprised of two pieces plus the c-clip, however the "missile" portion is not detachable. That section is painted red to make it look like a separate piece. Sideswipe's shoulder weapon is more cannon-like and just like RA's is molded completely in white plastic. It also features a mini c-clip to attach it to the shoulder bracket. The c-clips are fixed on to a hinged arm, but there's barely enough tension to allow you to point the weapons up. Beezleboss should have tightened those up a bit. In the kit we also find new blaster rifles for both Autobots and these are a huge improvement over the horrible engine/exhaust weapons the figures came with. 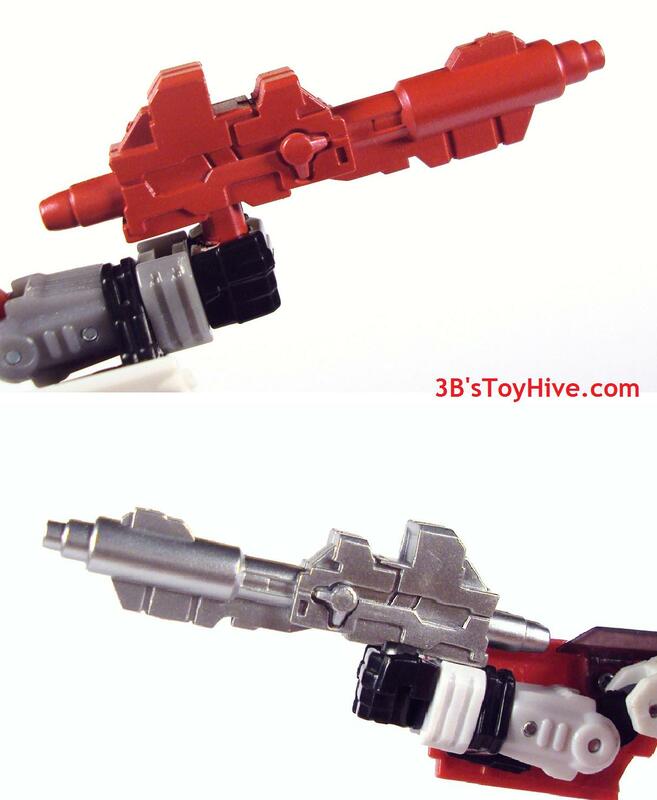 Both blasters are identical and seem to be molded in black plastic then painted red for Red Alert and silver for Sideswipe. I really like the sculpt on the rifles, but again the paint is an issue. Large patches of red paint have chipped off of the handle for Red Alert's rifle revealing the black plastic underneath. Now, it's not a big problem if it's just the paint on the handle that chips off, but if it starts happening on the rest of the weapon, I'll have to repaint it myself and that's just one more thing on the "to-do" list. I'm not 100% sure if Sideswipe's hand weapon is molded in black plastic, too, but the thick paint leads me to believe it is. I haven't had the chipping issue with 'swipe's rifle, but I'm handling it with kid gloves from now on. Sideswipe also receives a pair of "piledrivers" to replace his hands. I can't say I remember him using them all that much in the cartoon, but apparently they're popular enough that even Takara included some with the newly-released Masterpiece version of the character. Removing the hands isn't difficult, they're on a slotted peg that slides out one side of his arm. Putting the piledrivers in can be very frustrating, though, to the point I don't plan on ever posing the figure with them on. They have a simple, but nicely angled sculpt and look alright, I just don't really care about them either way. As if new weapons for Classics Sideswipe and Red Alert weren't enough of a draw, Beezleboss also threw in a new head for Red, replacing the reused SS head the figure comes with. True to Red Alert's appearance in the G1 cartoon, the "helmet" portion of the new head is red. The face is also very different from the one seen on the stock head. Petite, slender and seemingly over-protected by the large helmet. Perfect for a paranoid security robot like Red Alert. Putting the head on only required loosening the screw holding the front and back halves of the head together, then fitting it over the exsisting peg. It's not as tight as I'd like it to be, but works fine. Once on, the head fits perfectly into the chest cavity without disrupting Red Alert's conversion to vehicle mode. Overall I'm kind of torn over this set. On one hand it was only a few dollars more than the previous two Beezleboss sets, yet brings three times the amount of accessories. On the other hand the quality has seemed to regress from the superior Goldbug kit. I definitely feel the kit adds a lot to make Sideswipe and Red Alert look better and I don't regret the purchase. In fact, I'm looking forward to Beezleboss next project which is rumored to be a kit that converts Transformers Prime Ratchet into an IDW-inspired First Aid! That will help boost the fledgling Classics Protectobots which consist only of Hot Spot and Blades at this point. However, that FA kit will be under some heavy scrutiny because I expect the same level of quality we received in the Devil Horns and Growing Pains kits. As far as Heroic Duo goes, if you can grab it on sale, great. If not, take some time to evaluate how much you really want better weapons for these figures and a new head for Red Alert. It's not as sharp as we've seen from Beezleboss, but it does get the job done.